(Originally from KP double number November 2012 / February 2013, Vol. 54 Nr. 4 / Vol. 55 Nr. 1) The following item sold on e-Bay on July 25, 2009, for US $961. 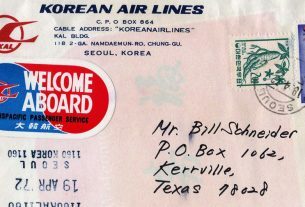 The 5 ch Liberation South Korea postal stationery card (Figure 1) was revalued and overprinted in mid-1950 by occupying North Korea forces with a 20 wn People’s Democratic Republic handstamp for postal use in South Korea. We have shown the handstamp in red and in a color filtered version (Figure 2). The only recorded used example of this overprinted card is dated 28 August 1950, and was used from Seoul GwangHwaMun to Yonghung in South Hamgyong province, North Korea. It is in my collection, having surfaced in the USA in 2017 and subsequently appearing in the most recent Interasia auction in Hong Kong. The overprinted value of 20 won, as pointed out by Florian, matched the rate current in South Korea at the time of the North Korean invasion. The South Korean card that was overprinted was the original 1946 First Anniversary of Liberation issue.All later iterations of this card bore uprating chops reflecting the gradual increase in postal rates in the 4 years following its introduction.The occupying forces obviously located a source of postcards which had not entered into circulation. The occupying forces also ‘legitimised for postal use’ (by way of a DPRK Post Office overprint) the three most widely utilised South Korean definitives (10, 20 and 30 won values) but did not alter their values. North Korean stamps were in limited circulation in occupied South Korea, and very occasionally they are found used in combination with either overprinted South Korean definitives, or the 1 won ‘Liberation of Seoul’ issue. 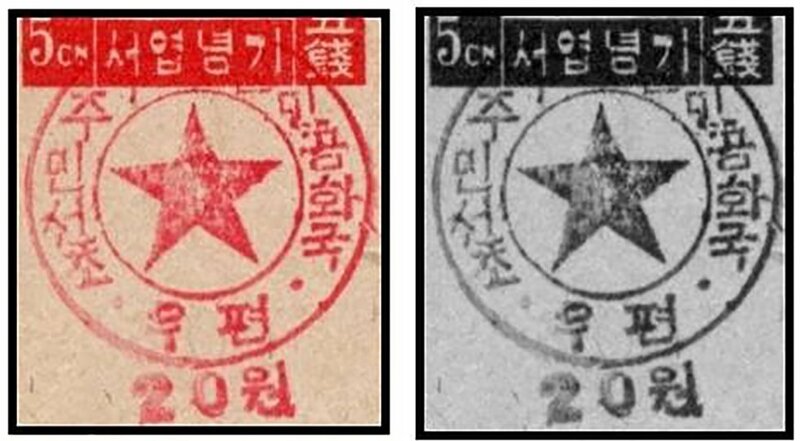 This propaganda stamp was intended for dissemination on mail throughout the occupied half of the Korean peninsular and is not recorded as having been used in the North. I would be extremely interested to know if anyone knows of a July usage of this issue. The highly dubious 10 July 1950 date of release has never been independently verified by any used examples, most of which are dated September and October 1950. Please send 300+ dpi scans of this item, it would be great to be able to see this unique piece of Korean philatelic history! It would be interesting to know how this piece managed to find its way out of North Korea. How did it get from Yonghung to the US? Apologies for the delay in getting back to you. Please tell me the best way to send the scans. I can’t cast much light on the card’s travels unfortunately. It may have been ‘liberated’ late in 1950 when the addressee’s home Area was occupied by UN Command Forces, but that’s a guess on my part. I believe the item had been in the previous owner’s possession for a long time. With regards to the occupying forces overprinting stamps, I’ve seen (and own in my collection) the definitive stamps that you mention (10, 20, & 30원). 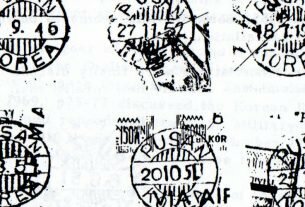 My question is, were any other stamps overprinted with the same handstamp. I have seen copies of the blue airmail stamp (KPS A2) overprinted with the circular stamp in red, plus I’ve seen (and own) the 1950 “Opening of Domestic Air Mail Service” stamp (KPS C31) with the same circular overprint in red, however my copy has the overprint inverted, which casts doubt in my mind as to its legitimacy as a genuine overprinted stamp. Any light you could help shed on this subject would be greatly appreciated. Hi Alexander, interesting question. If you send me scan(s) of the stamps you mention in your remark I will include them underneath this article so other members can see them and help out. 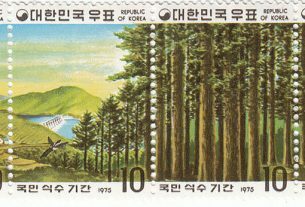 The unlisted overprints to which you refer, are, I believe later productions and were never issued during the NK occupation of South Korea. The originals were produced by a printing company in Seoul at the end of July 1950 as temporary subsitutes for the postage stamps of Syngman Rhee’s ‘puppet’ (as described by the NK authorities) administration. To my knowledge no examples of the handstamped overprints that you refer to have ever been recorded used.